This post is about a picture. This past weekend we had the pleasure of going up to the cottage and getting it ready for the season. The first couple of days were spent getting the grass cut and doing some simple repairs. The evenings were spent relaxing and watching the sun go down. Kincardine is home to some of the best sunsets I have ever seen. Bar none. When you see the sun go down on a cloud-free evening it is easy to understand how religions have been created to honour it. For the first time that I can remember we had cloudless sunsets 4 days straight. The sunset was never the same and it never gets boring to watch. On the the third night we were there Andrea asked Rhys if he would like to go for a walk with us on the beach. He enthusiastically said that he would. We went out and walked along the beach for a while. This entailed slowly walking, picking up sticks and stones and throwing them into the lake. Huron was like glass, aside from the ripples that Rhys was creating. For those who don't know Rhys let me explain. At almost 3 years old he is an impressive little guy. He is a totally different personality from Declan. Where Declan has always been very sensitive, Rhys just kind of ploughs through everything. He is a big boy and likes to play rough. Recently, he has become much more gentle which has been great. You don't worry that you are about to get a Glasgow Kiss when he goes in for a hug, you don't worry that he is going to hurt Leighton when he pats him on the head. He loves to snuggle and is genuinely full of love. While we were on our walk Andrea walked to the edge of the water where Rhys was throwing stones and crouched down. Seeing her do this he thought he should as well. I wish I had a better camera to capture that shot but I did what I could on my Blackberry. It may be one of my favourite pictures. I wish Rhys was old enough to remember that moment years from now. I think that it encapsulates everything that I love about being up at the cottage. Being there with my family, knowing the history that Andrea's family has in Kincardine and seeing how important it is to both her and our boys makes it easily one of the best places in the world. 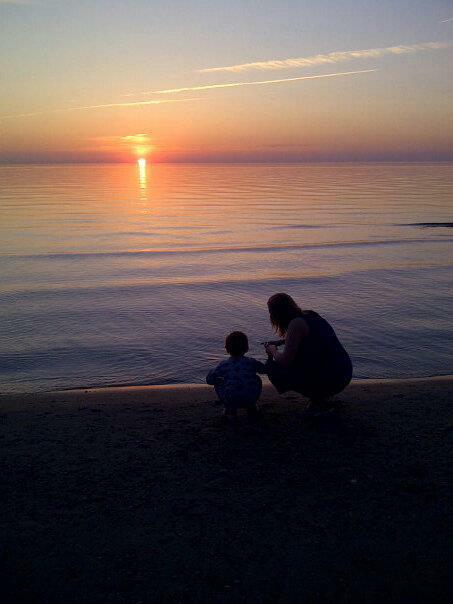 Watching Andrea with Rhys at the lake as the sun set is one of the best memories I can take from this weekend. I sincerely hope that everyone had a wonderful weekend.